My mother told me awhile ago about my great-great-grandfather’s workshop, where every nut, bolt, and screw had its own special compartment, every tool had its own particular hook. This awoke a hunger in me. Unlike many of my neighbors, we have always been able to park two cars in our two-car garage, but negotiating the way from the car to the hall door was hazardous – successive layers of cleaning out the trunk in order to go to the car wash, unloading from a camping trip, shifting material from an old office to a new one, and miscellaneous craft supplies had gradually encroached upon the shelving and floor and sink to the point where we could barely exit the cars once parked. 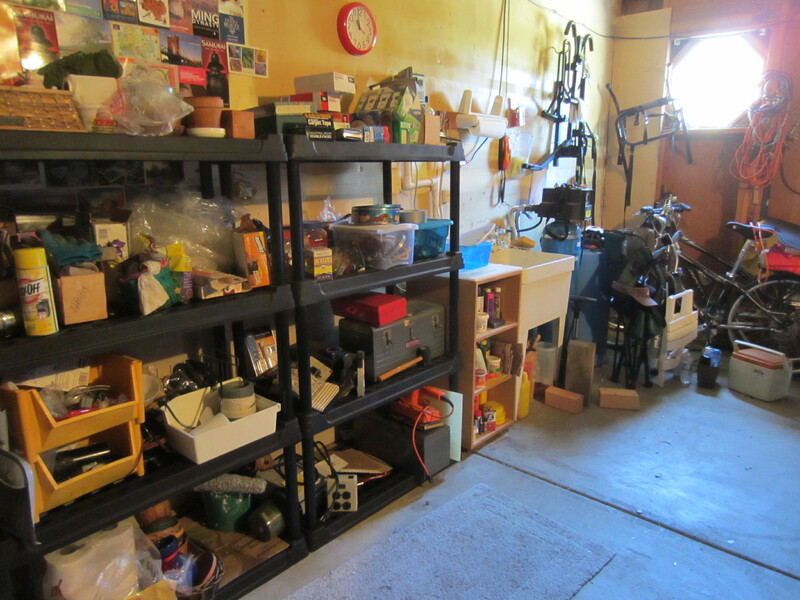 Once I started to work at home, “organize the garage” made it onto my weekly todo list. And there it sat, for week after week. “We’ll do it on the next rainy weekend” I told myself. It has been one of the driest winters on record. “We’ll do it when it’s warm enough to leave the door open so we can see what we are doing”. It has been colder than normal for weeks on end.. Finally something snapped. I went out and measured the space. Then I drew a plan, with height and depth and width of shelves needed. (Turned out not to be completely accurate, but that’s another story). Wow! What had I unleashed? Next thing I was swept into the car for a trip to the nearest home improvement mecca, where the most recommended shelving was in stock. The chosen shelving was the prefabricated plastic kind where you tap the pieces in place with a rubber mallet and a block of wood – my husband set to with gusto. There must be something atavistically thrilling about pounding things into submission – the shelving was assembled in no time. Now the hard part – emptying out the existing storage, purging what was not needed. and reloading. The”existing storage” consisted of two rough units knocked together from planks and covered with peeling contact shelf liner – I had salvaged it from a curbside when we first moved into the house. I optimistically put it out on the curb again for free-cycling along with an extra soldering iron, out-moded hot glue gun, macramé flower pot holder with ceiling hook, totally unused paint roller and pan, furniture gliders, wall shelving hardware and support (with shelves) and other redundant or outmoded items. All disappeared within hours except for the storage units, which my husband eventually had to whack apart and deliver to the local landfill. And finally – a floor! We can drive into our garage and get to the hall door without danger of tripping over anything! Could the attic be next? Congratulations Allyson! Well done! You would be happy to see my desk top now. I have purged the stacks that infested its surface. You may also open the bathroom cabinet without fear of avalanches.